Scientists in Singapore have developed a new octopus-inspired robot which can zip through water 10 times its body length within one second, in an ultra-efficient manner. 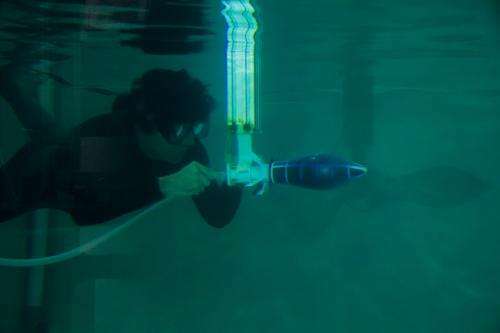 This first-ever ultra-fast propulsion and super-manoeuvrability demonstrated in underwater vehicles is unprecedented; and is the work of researchers and an engineer from the Singapore-MIT Alliance for Research and Technology (SMART). The first author, originally from SMART, is now with the University of Southampton. This ground-breaking research was published in Bioinspiration & Biomemetics and Nature in Feb 2015, and validates the physics of shape change (that forms the basis of jet propulsion of cephalopods) to give additional thrust to underwater vehicles. Inspired by the speed at which cephalopods like the octopus, flee from danger by inflating its mantle cavity with water to a bluff-body shape and then quickly expelling it to dart away, the researchers started building an octopus-inspired robot in November 2013. The end result is a polycarbonate 3D printed streamlined skeleton which had no moving parts (Fig.1) and no energy storage device other than a thin elastic outer membrane. It works like blowing up a balloon and then releasing it to fly around the room. The 27-cm long robot is inflated with water and once released, rapidly deflates by shooting the water out through an aperture at its base to power its propulsion. 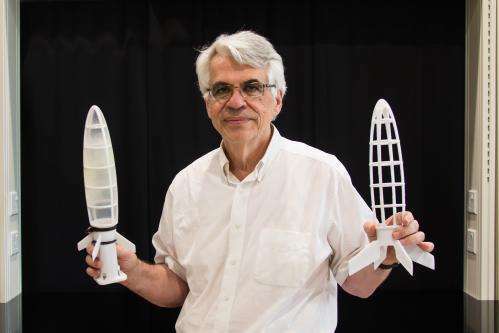 As the rocket contracts, it can achieve more than 2.6 times the thrust of a rigid rocket doing the same manoeuvre, while creating minimum turbulence – an important feature in underwater research / survey vehicles. The skeleton within the robot keeps the final shape streamlined, while fins at the tail, help in stabilization. Prof Michael Triantafyllou, SMART Principal Investigator (PI) for Centre of Environmental Sensing and Modeling (CENSAM), said: "When a fish escapes by swimming fast, it bends its body and zooms through the water, losing some energy to the surrounding water and recovering about 30% of the energy. An octopus, on the other hand, uses more effectively, energy recovery mechanism to power its ultra-fast escape, and is able to recover more than 50% of the energy available at the beginning. Hence, rendering this octopus robot highly energy efficient." Professor Michael Triantafyllou who is also the William I. Koch Professor of Marine Technology, Professor of Mechanical and Ocean Engineering and Director of the Center for Ocean Engineering at MIT, explained: "With this fundamental understanding in fluid mechanics, our research will pave the way for future robots that require fast maneuvers to help us get close to something that moves fast or quickly evade hazardous situations such as a sharp temperature rise in mid-ocean ridges. For instance, these octopus robots could follow dolphins for quick observation, or inspect thermal vents safely in the mid-ocean ridges." Underwater robot with 3D printed hull and elastic membrane demonstrates ultra-fast escape inspired by octopus. Mr Vignesh Subramaniam, research engineer with CENSAM, added: "Currently, no autonomous underwater vehicle (AUV) can achieve this ultra-fast performance except torpedoes which require a lot of fuel. With further R&D, future AUVs and other marine vehicles can adopt this mechanism to help it evade threats or track something fast stealthily underwater without the need for much energy." Moving forward, SMART will continue in its research on understanding the physics of jet propulsion underwater and implementing the technology on marine vehicles. I wonder how much money was spent on making this bottle rocket? Why we have so much "duh" science - whereas the replication of really important findings gets delayed for century?